If the Chinese delegation wished to call the attention of the international climate conference in Paris to the dangers of unchecked air pollution, it would only need to point in the direction of Beijing. When the conference, called COP21, began on Monday, Nov. 30, China’s capital was hit with a thick smog cloud that contained over 20 times the level of hazardous particles that the World Health Organization considers healthy. The smog, which began over the weekend, saw Beijing residents flooding the hospitals for respiratory maladies, and visibility was so poor that iconic buildings simply vanished in the acrid, gray blanket. Expats on Facebook posted selfies composed of solid gray boxes. In response, on Nov. 29 Beijing authorities issued an orange pollution alert, the second-highest level, advising the city’s 22.5 million inhabitants to stay indoors, and closing sections of highways. Over 2,100 companies in polluting industries, and all construction sites in the city, were also made to cease operations that day, according to the state-run China Daily. By the early hours of Wednesday, Beijing time, air quality in the city had improved to within healthy international limits, according to U.S. Embassy readings. The Beijing authorities’ rapid response to remedy the hostile air quality seems laudable and appears to lend some credibility to the Chinese regime’s COP21 target to slash greenhouse gas emissions by 2030. Yet this has already become a familiar scenario in recent years: the severe pollution, drastic curbs to polluting industries, and a stretch of clear skies before the smog creeps insidiously back in. There are still no signs that the regime has the will to translate its heavy-handed, short-term measures into sustainable, long-term initiatives to improve the environment. Beijing residents expressed frustration with the smothering smog, and many complained that the local authorities didn’t take action sooner. The smog is a serious health hazard because it contains carcinogens, tiny PM2.5 particles. On Nov. 30, levels of PM2.5 had reached over 600 micrograms per cubic meter in several parts of Beijing, and up to the 900s in some suburban neighborhoods. To put that in perspective, the World Health Organization considers any exposure above 25 micrograms over a 24-hour period as unhealthy. The Chinese Ministry of Environmental Protection said that the total area affected covered 530,000 square kilometers (about 205,000 square miles). The air quality had already exceeded the 300 mark starting Nov. 27. Chinese citizens are angry that the authorities have such a high threshold for issuing a red alert—a reading over 300 for three consecutive days—in which they would limit the number of cars on the streets by allowing only even or odd car plates to travel at certain times. The weekend smog was not limited to just Beijing: residents in the coastal city of Shanghai, eastern province of Shandong, and inland territory of Shaanxi also took to Chinese social media to report hazy conditions; netizens in Shanghai reported that they couldn’t see their outstretched hands. 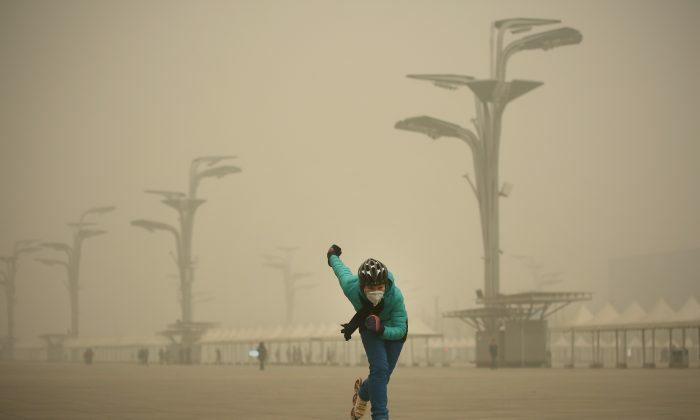 Chinese netizens, however, showed a sense of humor as the smog made midday look like early evening. 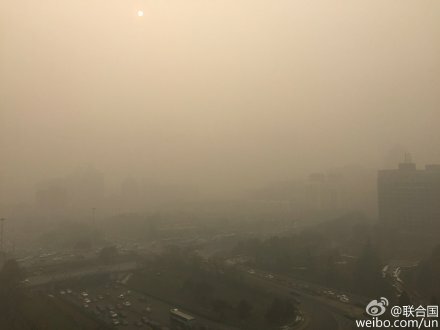 Several Weibo users retorted that the venue of the climate talks should be changed to Beijing—at least then they’d get clear skies. Whenever a major event is held in Beijing—think the giant military parade in September, the APEC meetings, or the 2008 Summer Olympics—azure skies reign as local authorities force factories and coal-burning power plants to stop work, and tightly restrict the number of cars on the road. Once the pollution control measures are lifted, however, “APEC blue” quickly turns to miasmic haze. In addition to polluting industries, Chinese authorities are blaming the recent bout of smog to pollution caused by heat generators as Chinese citizens crank up their heaters during winter. Chinese authorities don’t always resort to such draconian measures to curb pollution because they are unwilling to incur the economic costs. At the COP21 summit, China proposed that by 2030 it would cut emissions per unit of GDP by 60 to 65 percent from its 2005 levels. But these are rather modest targets, according to an analysis by Bloomberg, and the U.S. government’s Lawrence Berkeley National Laboratory, and wouldn’t make much of a dent in the trajectory that is projected by the various computer models used to predict global warming. China recently admitted it has been burning 17 percent more coal than previously estimated, a rounding error equivalent to the amount Germany burns each year. China is the world’s leading emitter of greenhouse gases. Coal is still used to supply about 65 percent of the country’s energy needs, and in 2013 it emitted 11 billion tons of greenhouse gases, compared to 5.8 billion by America, the second worse polluter, according to the World Bank. China accounts for nearly 30 percent of the world’s total greenhouse pollution. The Chinese regime has come to accept smog as the norm. On its official Twitter account, state-run media People’s Daily posted pictures of an “airpocalypse”; on Nov. 30, they reproduced a picture from a Chinese Internet user showing an air quality measuring device displaying a PM2.5 reading of 2,242—nearly 100 times the healthy limit. One Chinese official, Li Chunyuan, the vice minister of the Langfang Environmental Protection Bureau in Hebei Province, has even written an environmental-themed series of novels that is a best-seller. The second and latest book in the series is titled “To Die in Smog.” Li said his writing is “positive propaganda” aimed at inspiring people to take measures to combat pollution. Regular Chinese citizens are less optimistic. “The government is supposed to be tackling the pollution, so we need to see the effects. If in a few years the situation does not change, we will consider leaving,” Beijing resident Yin Lina told the AP. Yin had to take her 5-year-old daughter to the hospital after she suffered a blocked nose. I have excellent news everyone! The benevolent Chinese leadership has once again solved China's pollution problem. But even money can’t fix some forms of damage, like heavy metal-laced land and polluted groundwater.